Historically the flag of Biscay was red. When Sabino Arana created the flag, he wanted to give it the meaning "Biscay, Independence and God," so the red color of the field means Biscay, the green St. Andrew's cross means the independence of the Basque Country, and it is green because it symbolizes the oak tree of Gernika, symbol of Basque freedom, as well. The white cross means God [and it appears on the Biscay arms]. The Basque flag was created in 1894 by Sabino Arana (founder of Basque nationalism), and the name of the flag is Ikurriña, although the meaning of this word is "flag." Actually, it is used only for the Basque flag: Basque people prefer to use the Spanish word bandera for the other flags when they are speaking in Basque. The Ikurriña was created only for Bizkaia (Biscay, a region of Euskadi), but it became very popular and the rest of the Basque regions (4 in Spain and 3 in France) accepted it as the flag of the whole Euskadi. In the beginning only the Basque Nationalist Party (founded by Sabino Arana in 31 July 1895) used it, but during the Second Spanish Republic (1931-1939) all democratic parties accepted it. In 1936 the Basque Autonomous Government (whose Lehendakari – president – was José Antonio Agirre) was created, with representation of all the democratic parties, and the Ikurriña was declared by law the Basque flag. After the Spanish war, the dictatorship (1936-1975) declared the Ikurriña to be illegal, and it was totally forbidden and declared a separatist symbol. During the Second World War, there was a Basque brigade in the French free army, and the Ikurriña of the brigade was condecorated (because of the battle of Point de Grave, near Bordeaux). After the dictatorship and with the approval of the Basque Autonomous Community, the Ikurriña was declared again by law as the official Basque flag. In the Basque areas of France it has always been allowed and after the Second World War has been officially used in the town halls together with the French flag. I found this page at the Partido Nacionalista Vasco (EAJ/PNV) website, with an image of the original notes and drawings [dead link] made by the Arana brothers when they designed the Ikurriña (as the flag of the Biscay branch of the Nationalist Basque Party alone), including a long version of the flag intended for hanging (on balconies etc.). I seem to recall having seen a flag at an Eusko Jaurlaritza / Gobierno Vasco (Basque autonomous government) press conference displaying the coat-of-arms – certainly with the fourth plain red quarter. I ignore whether such use was ever officially sanctioned and if so at what date. I have never seen the Basque coat-of-arms displaying Navarre as the fourth quarter – though it might have been used before the Constitutional Court's ruling on the subject. Unofficial flags used by the Partido Nacionalista Vasco (EAJ/PNV), for instance, show the whole Zazpiak Bat with all six quarters, including of course Navarre. N.B. This is not an official flag; the Basque government uses the undefaced Basque flag; the official coat-of-arms has different colours and a plain red fourth quarter. In an article titled "Basque nationalist flag banned in Navarre," that deals with "war of flags in the Basque territories" there is a photo with the text: "Picture of woman holding the nationalist flag of the Spanish Basque province of Bizkaia." However, the flag seems more like the Ikurriña "Unidentified Flag" depicted above, i.e. the Ikurriña defaced with the Basque Country CoA. 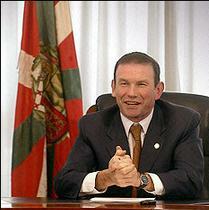 But this flag of the photo has a different design of the CoA and some words, which last one is "Euskadi." The photo can be seen, with the article, at navarre.org. In a Yahoo News slideshow, there is a picture (#22) of "President of the Basque regional government Juan Jose Ibarretxe seen during a meeting with his cabinet members in the northern Spanish Basque city of Vitoria." (Yahoo News (from AFP) 23 March 2006). The flag behind him appears to be Luc's UFE from 1998. This is the Ikurrin~a with a coat of arms. So this flag is used either by the regional government, or by the president of this government. The arms differ very slightly from Martucci's illustration: the small saltires in the bordure of the 2nd quarter are red, and there is a yellow background to the 3rd quarter. The first quarter is impossible to see, and the fourth quarter is clearly Navarre (our page includes information about how a plain red fourth quarter is used in the Spanish Basque country. The Tour de France cyclists passed an unusual version of the Ikkurina today. It was your standard Basque flag, red with the UJ-like white cross/green saltire combination, but in the centre of the white cross was a small red shield. Unfortunately I couldn't see what was in the shield, but it appeared to be mainly red in colour and was a sharply-pointed shape. Anyone any idea what this flag may have represented? Navarre? I was watching the tour this afternoon and saw a flag I hadn't seen before, one of which I can't find any information on: a Basque flag, but in consisted mainly of stripes (I think red and gold) with the Basque flag in the canton.